Since January 2013 I’ve had the distinct honor of leading walking tours of the Old Anacostia that Frederick Douglass saw with his own eyes, pounded with his own feet and lent his own activist voice and influence to. 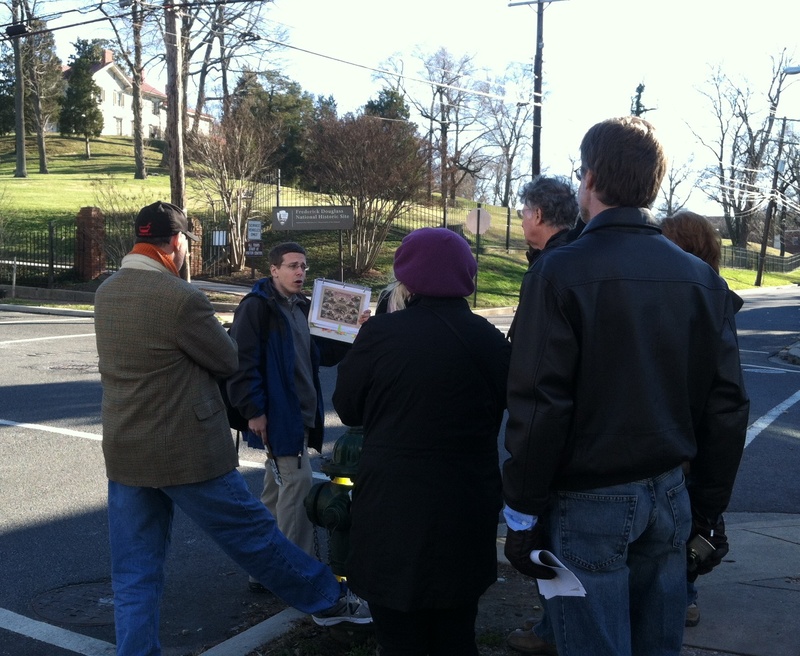 In nearly two years I’ve led tours for more than 500 people; young and old, intowners and out-of-towners, Europeans and Asiatics, and just plain good folks interested in the history of the city’s first subdivision. In February 2015 there are two separate opportunities to sign-up for the tour. STEPHEN SKIPPEN: We had a group of ten people attend the tour with John. Speaking on behalf of the group, everyone appreciated John’s humor, energy and passion that made the tour extremely enjoyable and left us with a good understanding of Uniontown / Anacostia through the eyes of Frederick Douglass. John’s knowledge of Washington DC, both past a present was very evident and captivating and I would certainly recommend this tour to anyone visiting this page. KENLYN MCGREW: This SideTour is the epitome of what SideTours should be. John is clearly an expert on the subject matter–his book, which we were able to purchase at the gift shop after the tour–proves that he’s academically well versed, and dates slip easily off his tongue as he talks. But he’s also clearly an expert on Anacostia, as well; as a reporter with years of experience covering the area, he knows Anacostia inside and out. As he walked us through the area, he was greeted by name by a dozen residents, who obviously knew and liked him. That kind of familiarity with the neighborhood cannot be overvalued, and it made the tour a fascinating mix of Anacostia’s past and its present. I couldn’t recommend his tour more highly!